you can’t afford not be using. enhance your CKEditor or TinyMCE with our powerful plugins. Simple yet powerful text tracking engine to track all yours and your colleague’s text changes. Easily add comments text and associate it with specific locations in your editor text area. 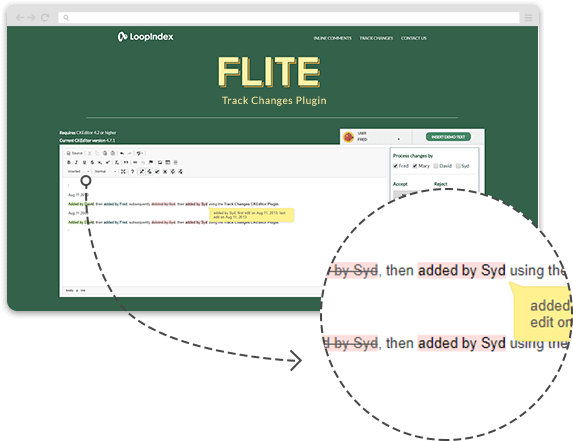 Track changes is commonly used to keep track of changes made by yourself or other users with access to edit text. Track Changes can be within a document or based on an online editor. An example of changes you track can include new text, deleted text as well as various styling and format changes. Easily add inline comments anywhere in the text. Supports multiple users with usful information such as the user’s name and avatar and the comments creation timestamp. 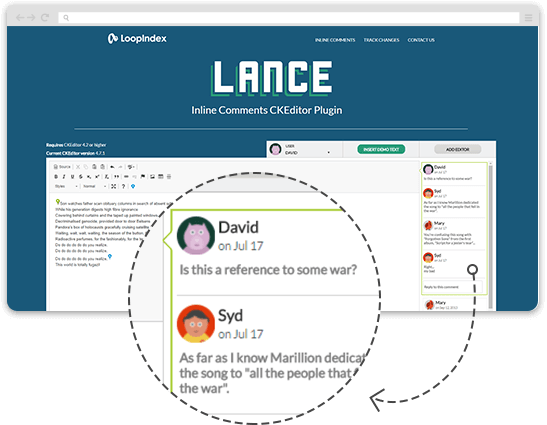 You can manage your comments with a reply, edit and delete operations. We are a small team of highly professional web experts who build simple yet powerful CKEditor and TinyMCE plugins. © Copyright 2019 Loop Index LLC.